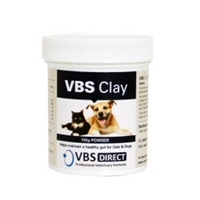 VBS Direct Ltd - VBS Clay - Innovative solutions for the veterinary professional. VBS Clay (Hydrated Calcium Aluminosilicate) is a geological nanomaterial that adsorbs bacterial enterotoxins and increases the reabsorption of intraluminal water in the gastrointestinal tract, resulting in clinical normalization of stool quality. VBS Clay is free of heavy metal contamination, contains no available alu- minum, is sterilized and ground to 80 micron particle size for improved dispersion and more rapid onset of action. Give one level scoop (provided inside pot) 4 times daily when diarrhoea is present. Give one level scoop twice daily for maintenance.